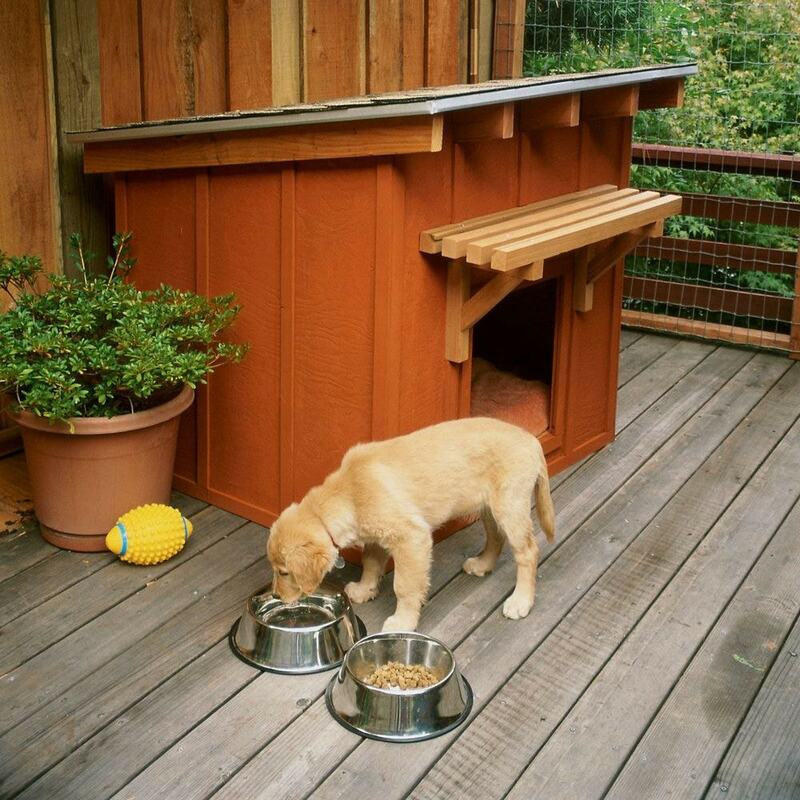 If you have a good building plan, you can create a lovely new home for your canine companion. 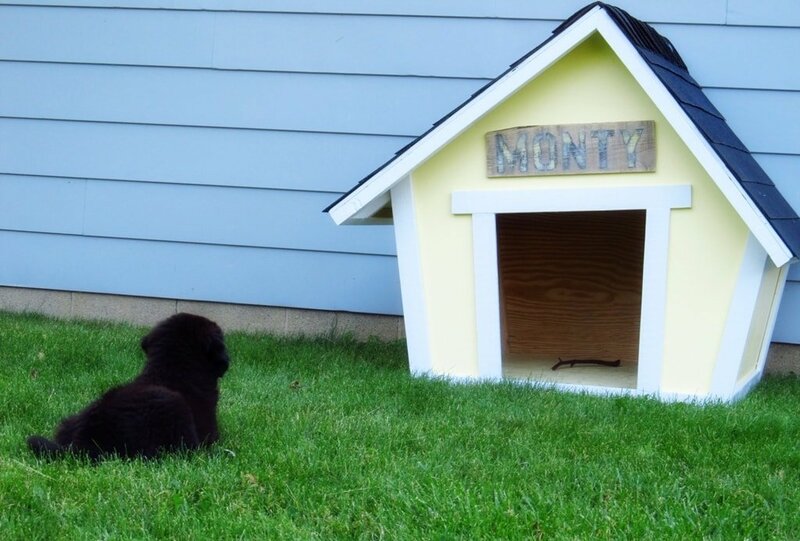 While getting a pre-built dog house is easy and convenient, it can’t compare to the feeling of putting in some effort and building a custom house specifically for your own dog. With some basic building skills, anyone can get through the process of building a reliable dog house. The only problem is that not all dogs have the same needs, so it’s important to choose the right plan for your pet. Dog houses come in different sizes so make sure you select a building plan that’s fitting for the size of your dog. If your pet isn’t fully grown yet, keep in mind how big will he become and take that into account when planning for the dog house. Simple dog house projects will take less than a day while more complex ones will require a few days to complete. If you already have some unused materials laying around, that takes us to another great advantage of DIY dog houses. They can be built cheaper compared to investing in a premade dog house. Let’s go through the best dog house plans to build your pet a beautiful new personalized home and make him as happy as possible. There are few houses that you can build for your dog that can match the stylish look of this Mini Ranch plan. This shelter design should be able to handle larger dogs as it has a generous size. Some of the highlights of this dog house include the little arbor installed above the door and the removable roof for convenient maintenance. The rustic ranch-house look comes mainly from the use of redwood lattice battens. 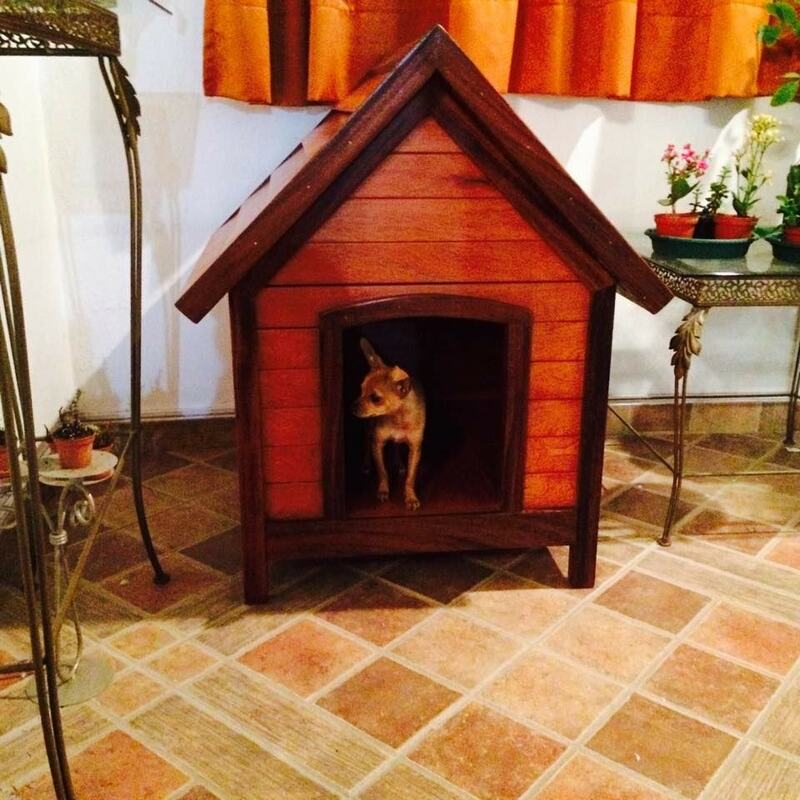 If you want your dog to live in luxury, this is a one-of-a-kind dog house. It’s a bit more complicated to manage by novice builders, but if you have some experience, this could be a fun project to try. 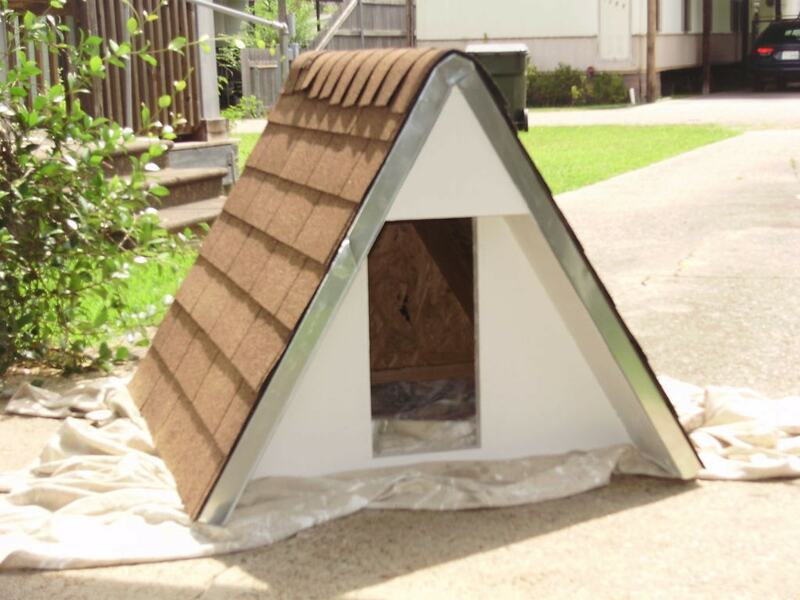 If you would like to provide shelter for your dog in a classic style, this simple gabled-roof dog house represents an excellent choice. 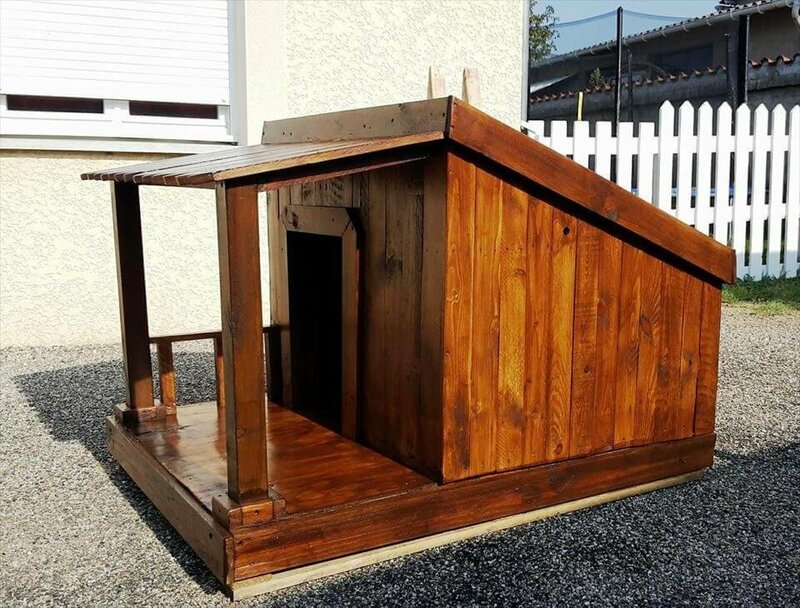 You can adapt the plan for this dog house to fit the size of your pet. It’s important to ensure the house is large enough, but try to keep the balance because dogs won’t feel as safe if the shelter is too big for them. All the parts of the dog house can be crafted from a single sheet of plywood. Try not to compromise on the quality of the wood and get the best possible type to prevent any harm to your dog. Overall, this dog house project is simple to tackle for inexperienced builders. Once you give it the final finishing touches, the dog shelter will look very nice in the yard. Larger canine families will require a bigger shelter. This modern dog house plan can help you fit all your dogs in perfect comfort. While it’s built by default to be large, it can be adapted to match your particular needs. The main aspect that makes this dog house stand out from classic dog house designs is the tiny home resemblance. Check out the complete instructions, including a detailed video tutorial, at this link. Instead of sticking to the usual conventions, this dog house plan takes a different approach. It creates a crooked design for a touch of character and some cartoonish vibes. The dog house can be built without too much effort as its creator provides detailed instructions and diagrams to help you. 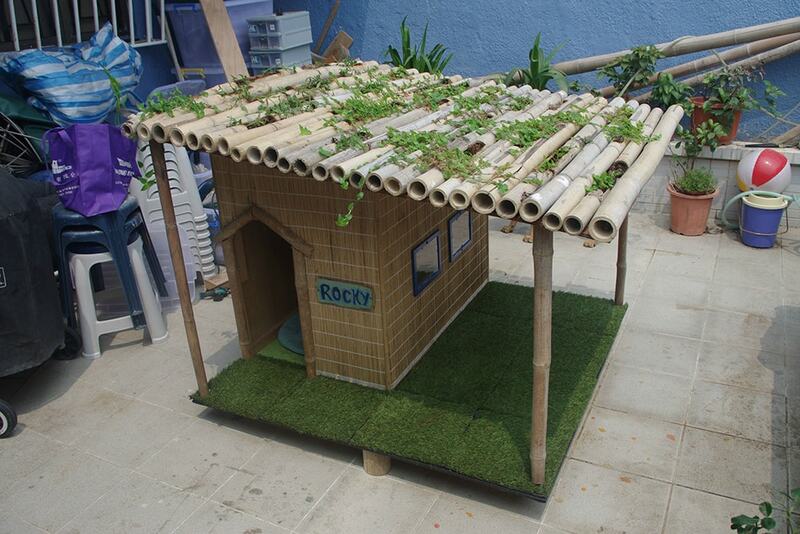 The result is a large and comfortable dog shelter that stands out from the crowd. There are lots of reasons to opt for a mobile dog house in case you don’t want your canine companion to reside somewhere permanently. 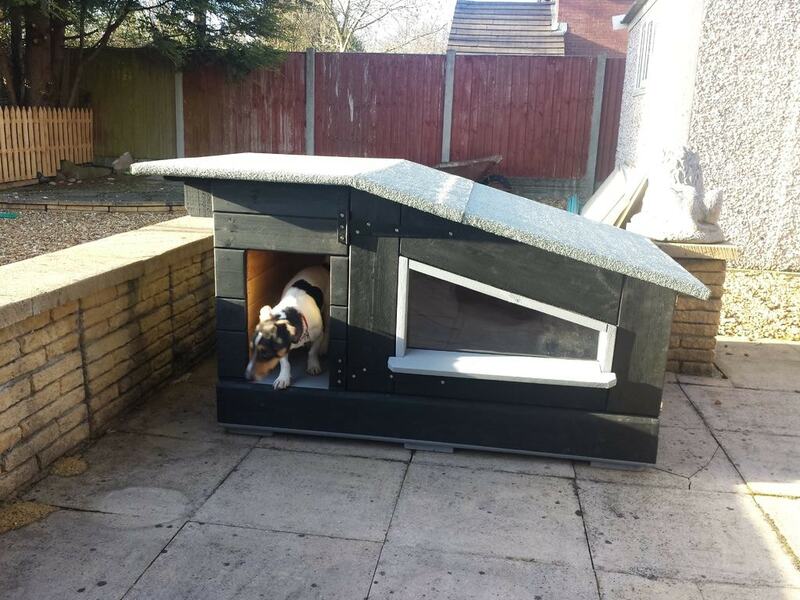 This is a great project to consider if you wish to DIY a new home for your dog. With a few supplies and by putting in some hours of work, you can obtain a nice-looking home that can be moved around with ease. Just make sure you measure your dog well to adapt the house size to his needs. 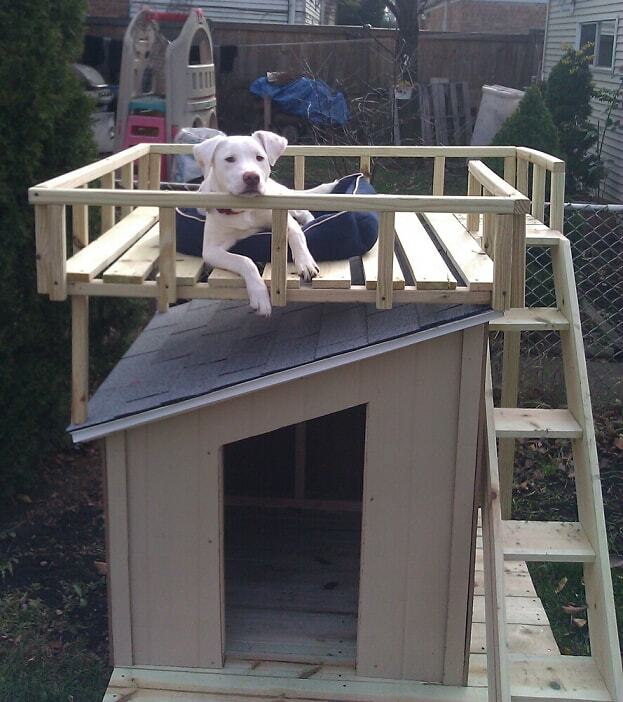 Building a luxurious house for your dog won’t require very expensive supplies. Take a look at this innovative plan that makes clever use of pallets and plywood to build a spacious dog house. 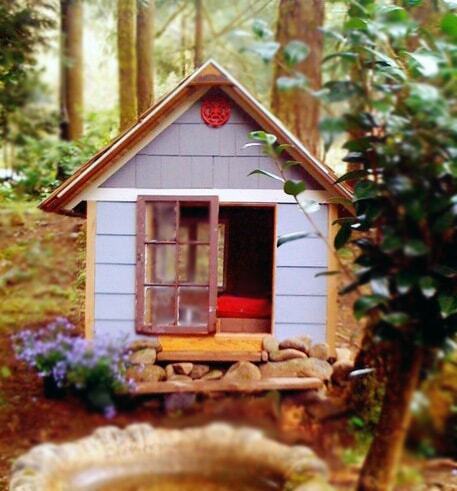 We like the miniature porch that gives this little dog house an inviting vibe. You can learn how to put together this shelter by following the in-depth guide provided. This is an adorable home for a dog considering how it has all these built-in extras such as the deck, toy box, and a dedicated spot for food and water. The project is not very difficult, but you’re most likely going to need a large area to build the dog house. All the details regarding this dog house plan can be found by accessing this link. 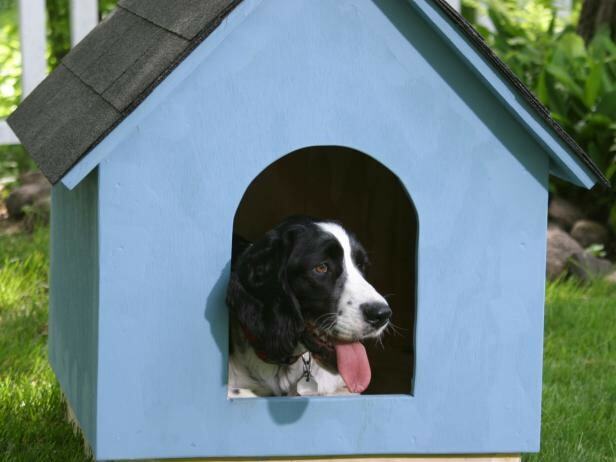 Giving the dog house a more specific theme can be a good idea to craft a personalized shelter. Take a look at the instructions for creating a dog house with tropical vibes. It’s perfect for high-humidity areas and it has some features to keep your dog more comfortable when it’s hot outside. To add some tropical textures, you need to bring in bamboo pieces and some greenery that has very low soil and water requirements. We also like the roof design that permits for improved ventilation. The lounge area outside the house is like a bonus feature that’s sure to be appreciated by your dog. This is a modern dog house that includes a porch light that probably helps the pet feel more secure after dark. In any case, it’s a creative addition that also enhances the overall design of the shelter. An average-sized dog should fit nicely in this house, but you should check the measurements just to be sure. If you want to build this fun dog house, the step-by-step tutorial is available here. Beginner builders might become easily overwhelmed by some of the complex dog house projects out there. Check out this easy plan from Lowe’s that teaches you how to build an attractive and safe dog shelter without too many difficulties. 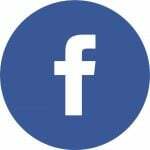 As long as you understand the basic principles and follow the user-friendly steps attentively, the final result will be very rewarding. Building a stylish dog house without spending too much is totally possible. The plan for an insulated A-frame pet shelter will allow you to craft a stylish home with a 9-foot base. This means that most medium-sized dogs should fit quite comfortably. 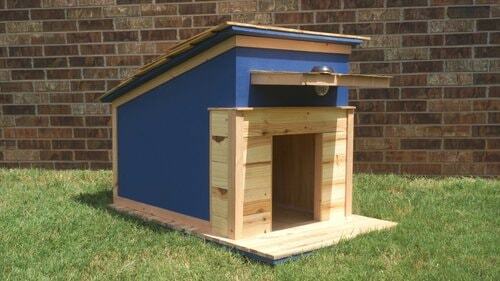 Go over at Instructables for blueprints and the full guidance to build this dog house. 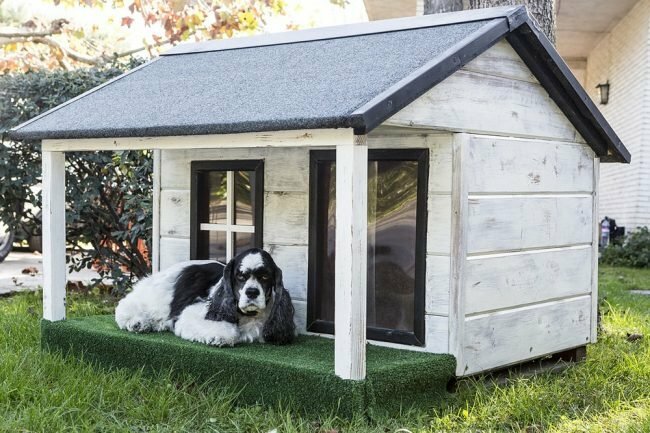 Here’s a more unique twist on the conventional dog house as it comes with an outside structure designed to allow your dog to lounge around more comfortably. The house itself is fairly simple though it does have a nice platform. You can leave it at that and not build the upper sun deck, but we think it’s worth the extra effort for your dog’s comfort. Check out the plans for this dog house. Using White Cedar and Guanacaste trim, you can build a fancy looking dog house in a cottage style. The shelter provides insulation and comes with a removable roof to simplify the cleaning process. This is not exactly a beginner-friendly project, but it’s worth taking into account considering the aesthetic potential. Aside from detailed instructions and pictures, you can also watch a video to be able to put everything together correctly. 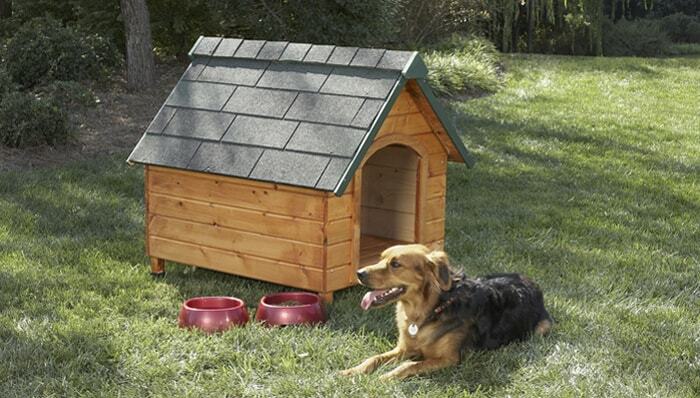 This is a great dog house you can build for cheap without compromising on a luxurious design. All you need is some pallet wood and some stylish black paint to craft a satisfying shelter for your beloved canine companion. 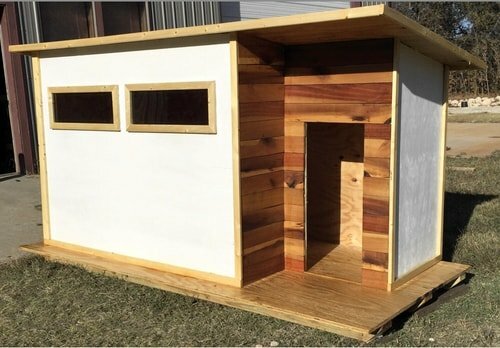 While many store-bought kennels have flimsy designs, the plan for this dog house will allow you to build a durable new home that comes with a sun deck as a bonus. 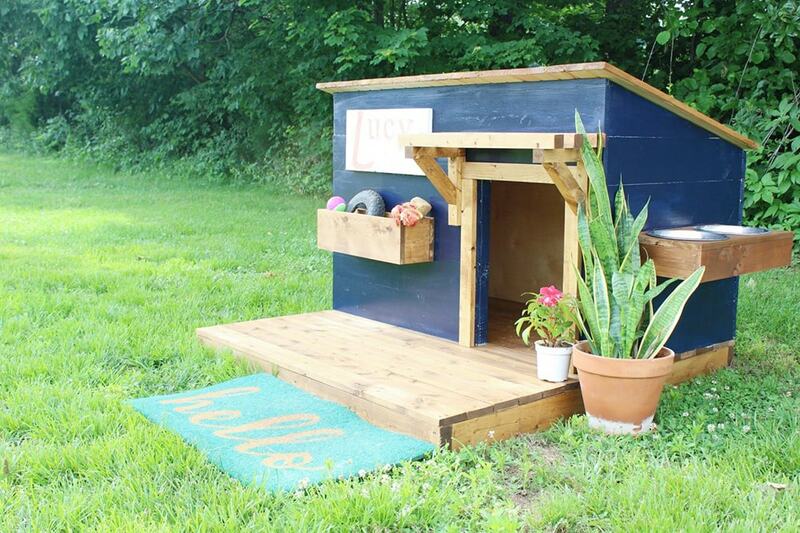 Crafting a custom house for your dog is possible even if you only use salvaged leftovers from other projects. 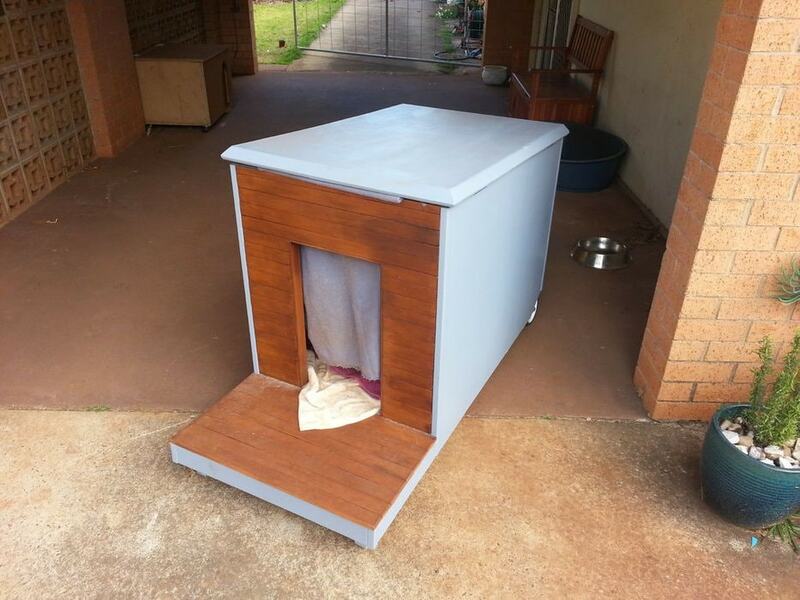 This dog house can be built almost for free if you can make use of leftover materials. In case you want to build it from scratch, there is a list of supplies that need to be bought. The plan for this DIY project also contains graphic guidance and many helpful tips. Build a cozy dog house without too much effort.